Ouch! What’s this about the world hating you? This seems like a horrible thing to face, but as it turns out, it is a blessing. First, you have something the world wants. 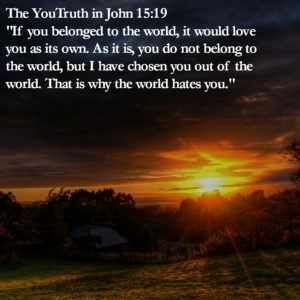 You have been chosen out of the world and into the Kingdom of God. In the Kingdom, insecurity and material desires are replaced by eternal hope and love. And the world desperately needs it. Second, you play by a different set of rules. When the world wants something, it conquers those that have it. It outruns them, steals from them, hoards the desired things and builds up defenses around them. Not one ounce of the Kingdom’s blessings can come to those who use these tactics. You have secured your Kingdom blessings by doing the exact opposite. You have submitted to Jesus’ authority and allowed Him to conquer you. Through your humility, gratitude, contentment, and generosity toward others, the Kingdom is forever yours. There is hope for the world! As you know, you were once of the world and found your way out of it. But until all find their way out too, there will be some who scoff, persecute and yes, even hate. It’s a weird way of knowing that you have gotten it right. Allow the world to see what you have and how you have secured it today. While many will hate you for it, others will find their way out because of it. The Kingdom’s blessings far outweigh the world’s trouble!